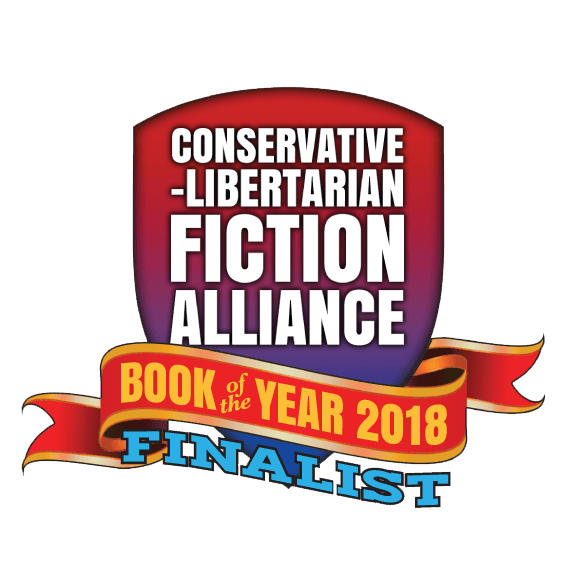 The finalists for the Conservative Libertarian Fiction Alliance’s 2018 Book of the Year award have been announced. The public survey opens April 2. Check the website. (1) THE FLAG IS UP. 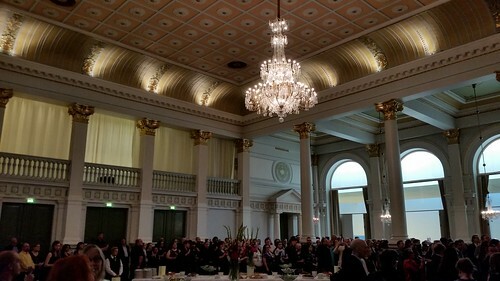 Kevin Standlee and other selected members of Worldcon 75 attended a reception hosted at the Helsinki City Hall to welcome Worldcon to the city. (2) INDEPENDENCE DAY. Did you notice that Hoboken, New Jersey, is a sovereign country now? At least, it has a line of its own in Worldcon 75’s membership update, just like the Vatican City State. (3) STAR TREK FAN FILM ACADEMY. “Post-Axanar, CBS unveils first official fan filmmaking initiative in Trek history” – ArsTechnica has the story. After pushing a nearly year-and-a-half copyright battle with fan filmmakers toward a settlement earlier this year, CBS and Star Trek New Voyages Producer James Cawley announced the creation of a Star Trek Film Academy equipped to train interested creators and produce future fan films. This marks the first official, CBS-sanctioned fan filmmaking effort in Trek‘s 50-plus year history. The academy will start business in the fall with the first films expected in Spring 2018. Unlike prior Trek fan films or those made under newly announced guidelines, films done through the Star Trek Film Academy will be able to employ people who’ve worked on professional Trek productions. These Academy fans and films will also have access to the New Voyages sets and facilities [on Ticonderoga, NY]. New Voyages is a fan-made Web series Cawley helmed from 2008 through 2015, creating about one episode per year. Though the series was not officially a CBS production, sets constructed for New Voyages became licensed as a “Studio Set Tour” beginning in July 2016. Throughout its run, New Voyages featured contributions from major Trek players like George Takei (reprising his role as Sulu) and Eugene Roddenberry, Jr. (as a producer). (4) LOVE FOR DRAGON AWARD NOMINEES. Congratulatory posts show where some of the nominees have their strongest support. Congratulations to the Five Inkshares Authors Nominated for the 2017 Dragon Awards! DragonCon, the pop culture, fantasy, sci-fi, and gaming convention based in Atlanta, has announced their round of 2017 nominations for the coveted Dragon Awards. Previous winners include Terry Pratchett, Naomi Novik, and Neil Gaiman. This year a whopping five Inkshares authors have been nominated! These talented authors will be representing Inkshares in their respective categories and we couldn’t be more proud! (5) ANOTHER COUNTY HEARD FROM. N.K. Jemisin seems to have learned about her Dragon Award nomination…today? It would really have been nice to be notified about this. By someone. Anyone, really. At some point. (6) CHANGING OF THE GUARD. BoingBoing’s Cory Doctorow reports “Toronto’s amazing science fiction library, the Merril Collection, has a new head librarian”. I think Judy Merril would have loved this approach. I was trepidatious when I heard Lorna was stepping down as the library has been such a fixture in my life, but Ms Hosein sounds like a brilliant successor. Hosein has taken the reins from longtime collection head Lorna Toolis, herself having moved from managing another formidable research collection — Toronto Public Library’s Canadiana Collection at the Toronto Reference Library. Gregg Calkins in 2013: a photo from his old blog. (7) CALKINS OBIT. Longtime fan Gregg Calkins died last week after suffering a fall. He was 82. Gregg got active in fandom in the Fifties and his fanzine Oopsla (1952-1961) is fondly remembered. He was living in the Bay Area and serving as the Official Editor of FAPA when I applied to join its waitlist in the Seventies. He was Fan GoH at the 1976 Westercon. Calkins later moved to Costa Rica. In contrast to most of his generation, he was highly active in social media, frequently posting on Facebook where it was his pleasure to carry the conservative side of debates. (8) COMIC SECTION. John King Tarpinian found a real fish story in today’s Bizarro. (9) THE MERCURY 13 STILL AIM FOR THE STARS. An early astronaut candidate, rejected for being female, may finally go into space: “This Pilot Is Headed To Space With Or Without NASA”. Wally Funk has spent her life in pursuit of a dream. The pilot, flight instructor and almost-astronaut longs to go to outer space. In 1961, she was part of a group of female pilots who took part in tests to determine whether women were fit for space travel. The project was run by the same doctor who developed tests for NASA astronauts and the women became known as the Mercury 13. “I get a call said, ‘Do you want to be an astronaut?’ I said, ‘Oh my gosh, yes!’ And he said, ‘Be here on Monday to take these tests,’ ” the 78-year-old Funk recounted to her friend and flight student, Mary Holsenbeck, during a recent visit to StoryCorps in Dallas. …. Funk bought a ticket for Richard Branson’s Virgin Galactic commercial spaceship and hopes to be on board its maiden voyage into space. Holsenbeck plans to be there, cheering Funk on when she finally blasts off. (10) NEW VIEW. Using glass may be the best way to fix broken bones. Thompson’s answer was to build the world’s first glass implant, moulded as a plate which slotted in under the patient’s eye into the collapsed orbital floor. The idea of using glass – a naturally brittle material – to repair something so delicate may seem counterintuitive. But this was no ordinary glass. For Thompson, the results were immediate. Almost instantaneously, the patient regained full vision, colour and depth perception. Fifteen years on, he remains in full health. (11) STICKER SHOCK. Langford’s basilisks vs. AI: “The tiny changes that can cause AI to fail”. The year is 2022. You’re riding along in a self-driving car on a routine trip through the city. The car comes to a stop sign it’s passed a hundred times before – but this time, it blows right through it. To you, the stop sign looks exactly the same as any other. But to the car, it looks like something entirely different. Minutes earlier, unbeknownst to either you or the machine, a scam artist stuck a small sticker onto the sign: unnoticeable to the human eye, inescapable to the technology. In other words? The tiny sticker smacked on the sign is enough for the car to “see” the stop sign as something completely different from a stop sign. It may sound far-fetched. But a growing field of research proves that artificial intelligence can be fooled in more or less the same way, seeing one thing where humans would see something else entirely. As machine learning algorithms increasingly find their way into our roads, our finances, our healthcare system, computer scientists hope to learn more about how to defend them against these “adversarial” attacks – before someone tries to bamboozle them for real. (12) STAR TREK: DISCOVERY. ScienceFiction.com transcribed the show’s new intro. As we stand at the edge of an unknown universe, we know our greatest challenges lie before us, that our future is not bound by fear and that our mission is not to conquer, but to discover. That is our destiny, a destiny written in the stars. So, we boldly go where we have never gone before. And yesterday CBS put out these brief videos of the crew and characters in the new series. Our mission is not to conquer, but to discover. Captain Philippa Georgiou of the U.S.S. Shenzhou. Stream #startrekdiscovery starting Sept. 24 on CBS All Access. "We are creating a new way to fly." -Captain Gabriel Lorca #StarTrekDiscovery premieres September 24th! Meet Voq! #StarTrekDiscovery premieres on CBS All Access on September 24! (13) THOSE AREN’T BABY BUMPS. Nicole Weaver, in “‘Star Trek: Discovery’: Cast Reveals Why the Klingons Look So Different”, reveals, among other reasons, that these Kilingons have ESP! According to the designer, Neville Page, the ridges act as extra-sensory receptors on the Klingons’ heads and backs. Per io9, this is because the Klingons are “apex predators” and would need this to make it to the top of the food chain. One of the Klingon actors, Mary Chieffo, went into detail about this new development. Obviously the hair was the biggest thing people noticed, or the lack thereof. And I will attest to the fact there is a reason my ridge goes back the way it does. There are sensors and pheromones…There is a whole reasoning behind it that is adhering to what has always been true in Klingon canon…So I deeply believe we are in line with what has come before but is also adding a new kind of nuance. (14) CAMEO. New York Mets pitcher “Noah Syndergaard was on ‘Game of Thrones.’ He died.” says NBC Sports’ Craig Calcaterra. The Dodgers absolutely killed the Mets this past weekend. As they were collectively dying yesterday evening, Noah Syndergaard was dying individually over on HBO. It was on “Game of Thrones,” which featured a blink-and-you’ll miss it cameo from Syndergaard as a member of the Lannister army. His big moment: he threw a spear and killed a horse. Best throw he’s had all year given the injuries that have sidelined him since April. He’s likely done for the season when it comes to baseball — he hasn’t started throwing yet — but he’ll never come back to Westeros, as he was burnt to death by a dragon. That’ll put a guy on the 60-day DL for sure. (15) NOT THE KENTUCKY FRIED MOVIE. Adweek finds the drumsticks are bigger in Georgia: “The Giant Chicken From KFC’s Marietta, Georgia, Store Springs to Life in W+K’s New Film”. It’s not every day you get to see a building in the shape of a giant chicken, let alone one that can get up and walk away. But that’s the delightfully hallucinogenic conceit of a sweet little five-minute animated short from KFC and Wieden + Kennedy, celebrating the renovation of one of its marquee restaurants with a story of a little boy who befriends a roving animatronic fast-food store. Marietta, Georgia, an Atlanta suburb, is home to The Big Chicken, a KFC franchise famous for its unusual architecture—namely, a towering, 56-foot-tall, angular red hen with mechanical eyes that roll in slow 360 degree circles, and a beak that opens and closes in sync, like some deranged obstacle in an 8-bit video game. The winner was determined by a public vote on ten finalists selected by CLFA members. Placing second was Monster Hunter Memoirs: Grunge by John Ringo (Baen Books), and coming in third was Iron Chamber of Memory by John C. Wright (Castalia House). (1) HELSINKI NEWS. Worldcon 75 is holding an Academic Poster competition and would very much like participation from as many university students and researchers as possible. We are hosting a science, technology, engineering, mathematics, and medicine (STEMM) poster competition for undergraduate students, graduate students and post-doctoral researchers. The competition is also open to posters that explore the connections between STEMM subjects and SF/fantasy/horror. There will be a €100 prize for the poster that best communicates research to the general public. Presenters will be able to share their research with an audience that is very interested in science, technology, engineering, mathematics, and medicine, but where many audience members will not have been formally educated in STEMM subjects. In addition, presenters will be invited to give five minute mini-talks on Saturday 12th August 2017 explaining their research. Taken together, the posters and mini-talks represent an exciting opportunity for the presenters to practice research communication, and for audience to learn about cutting-edge research. If you are interested in displaying a poster then fill in our web form below or follow this direct link to the form. The deadline for applications is 1st May 2017 and we will inform you of our decision by mid-June. The Munitions Factory is a play about love, money, revolution, and the military industrial complex. Set in Imperial Germany in 1917 during the worst winter in German history, The Munitions Factory is really about our world in the 21st century. It is a hard driving play that will jar you out of your complacency, and it is also a compelling love story about characters who walk the razor’s edge between desperate love and repulsion that is common in wartime. The submission form is here for any Campbell-eligible authors (first pro publication in 2015 or 2016) who want to submit a sample of last year’s work. (4) ODDS FAVOR THE HOUSE. 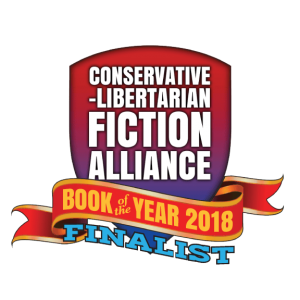 The Conservative-Libertarian Fiction Alliance opened voting today for the CLFA Book of the Year Awards. CLFA an online group of readers, authors and other creative individuals who want to see more freedom-friendly storytelling in the marketplace. We provide our members with networking opportunities as well as a safe, friendly and open environment for both political and creative discussions. We are currently at over 1300 members strong, with new participants joining us on a daily basis…. CLFA Book of the Year Awards, now in their third year, seek to recognize the best in freedom-friendly fiction. To qualify for entry in the CLFA 2017 Book of the Year contest, the work has to be over 50k words and first published in any form in 2016. Our members voted to arrive at the Top 10 list, which is now open to the public for the final vote. Voting is open until midnight on March 31, 2017. Winners to be announced in April 2017. Voting happens here. At the moment Peter Grant’s novel from Castalia House is leaving the field behind. He’s got 50 votes to 25 votes for John C. Wright’s novel (also from Castalia House). Last year’s Dragon Award-winning Souldancer by Brian Niemeier has one vote so far. (5) INJUSTICE. Australia writer Tom Taylor, of Injustice Gods Among Us and Injustice 2 comics, told his Facebook readers he won’t be at Emerald City Comic Con this week and or other U.S. events. Sadly, I won’t be attending Emerald City Comicon in Seattle this week. I have also turned down all other US signing and convention invitations so far this year. I know I’m far from the only person concerned about traveling to the States at this time, but I wanted to explain my decision. I want to start by saying this decision was incredibly difficult. I was really looking forward to this trip. I have traveled to the US regularly since 2009. This year, I have four different books with three different publishers, and a TV series to promote. Beyond this, I have fans and colleagues I was looking forward to meeting. I also have many good friends in the States, and I was looking forward to catching up with all of them. Truth be told, I’m missing them. But America, through no fault of most of its citizens, doesn’t feel like a safe or welcoming travel destination at this moment. There have been reports of interrogation, phone data downloads, requests for social media accounts, returns and five-year travel bans and everyone from children to the elderly being detained. All of this has many people I’ve spoken to reconsidering or cancelling their US travel plans. I’ve had friends and people I work with suggest I leave my phone at home, or delete my twitter account for a month before I come. My twitter account isn’t complimentary towards the current administration, but it’s far from inflammatory and shouldn’t need to be scrutinized to gain entry to a country where free-speech is so highly valued. Traveling fifteen hours on a plane is bad enough. Travelling towards uncertainty, half-worried about being caught in limbo by overzealous border security, with my wife and children wondering why I haven’t called, is nightmare fuel…..
(6) PENRIC SEQUEL. 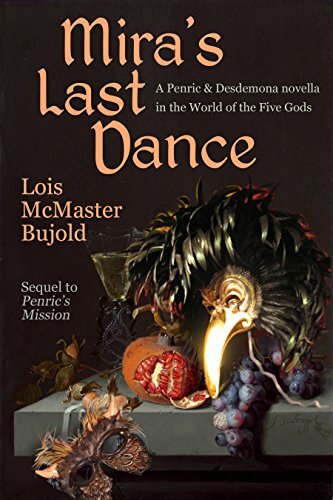 Lois McMaster Bujold’s latest novella Mira’s Last Dance (Penric & Desdemona Book 4) is out. (7) VOTE FOR PAUL WEIMER. Ten days ‘til Down Under Fan Fund voting closes. The deadline is midnight, March 10 (PST). Our Paul Weimer is the only candidate for the trip to the Australian National Convention, but the contribution of $5 or more accompanying your vote will help keep the fund going during and after Paul’s trip. Click here to get started. I’m a podcaster for the Skiffy and Fanty podcast, the SFF audio podcast, a noted SF/F book reviewer and a regular panelist at local cons. I am also an amateur photographer. I have only been to one international con, the Worldcon in London in 2014, and would love to broaden my international fandom connections. 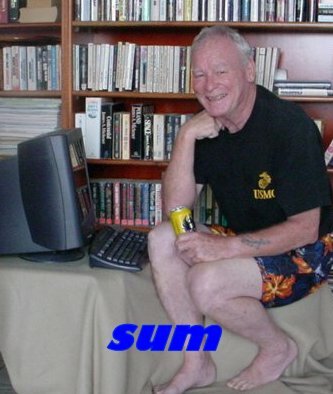 If I have the honor of being selected, I aim to build the links I already have with Australian fandom (in things like being a prior participant in The Australian SF Snapshot) into face to face interviews, meetings, and more with fans and genre folk at Continuum and elsewhere in Australia. Have camera and recorder and ready to travel! Nominators: North America: Mike Glyer, Arref Mak, and Jen Zink. Australasia: Gillian Polack and Alexandra Pierce. (8) GLOWING REVIEWS. Jason continues to burn the midnight oil and has melted down another month of online science fiction and fantasy offerings into a shiny list of favorite stories in “Summation of Online Fiction: February 2017” at Featured Futures. (9) SMALL WORLD, BIG NEWS. ChiZine Publications has cut an illustrated book deal with George A. Romero, creator of The Night of the Living Dead. They have acquired The Little World of Humongo Bongo, an illustrated book, originally published in French. The Little World of Humongo Bongo is the tale of fire-breathing giant Humongo Bongo, who lives on the tiny planet of Tongo. Gentle and curious, his world is thrown upside down when he encounters a race of tiny people named the Minus, who initially worship him as a God but then turn on him when they succumb to fear, greed and the lust for power…. The Little World of Humongo Bongo will be published in Fall/Winter 2017, in association with Dave Alexander’s Untold Horror, a multi-media brand dedicated to exploring the greatest horror stories never told. March 1, 1692 — The Salem Witch Trials began in Massachusetts with the conviction of West Indian slave, Tituba, for witchcraft. (11) CALLING ALL SMOFS. Kevin Standlee shared the news that as of yesterday there was still no bid for the 2019 Westercon, to be selected this July in Tempe. Any site in Western North America (or Hawaii) is eligible. (Nobody filed by the end of December 2016, so the exclusion zone is suspended.) The filing deadline for the ballot is April 15, 2017. If no bid files by then, site selection won’t have any bids on the ballot, and I probably will have to ask Tempe for a larger room and longer time slot for the Westercon Business Meeting. So here’s your chance to host a Westercon! It’s approximately the same as Worldcon, with minor differences. The outline is the same: file bidding papers, and if the voters at the administering Westercon select you, you get the bid. If nobody wins, the Business Meeting decides. (12) SLCC UPDATE. 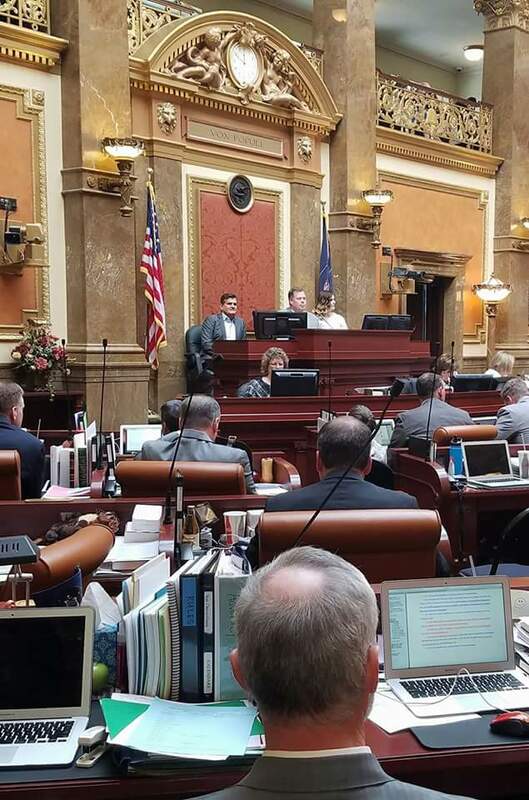 Here’s Bryan Brandenburg of the Salt Lake Comic Con appearing before the Utah Legislature (to the right of the flag). In his address, Bryan emphasized that their intent is to fill the void and not replace the other commercial events. (13) ROBOMALLCOP. Francis Hamit is sufficiently impressed with the company that he bought some stock. “I thought this might be of interest. Securitas is the largest provider of contract human security officers in the world. 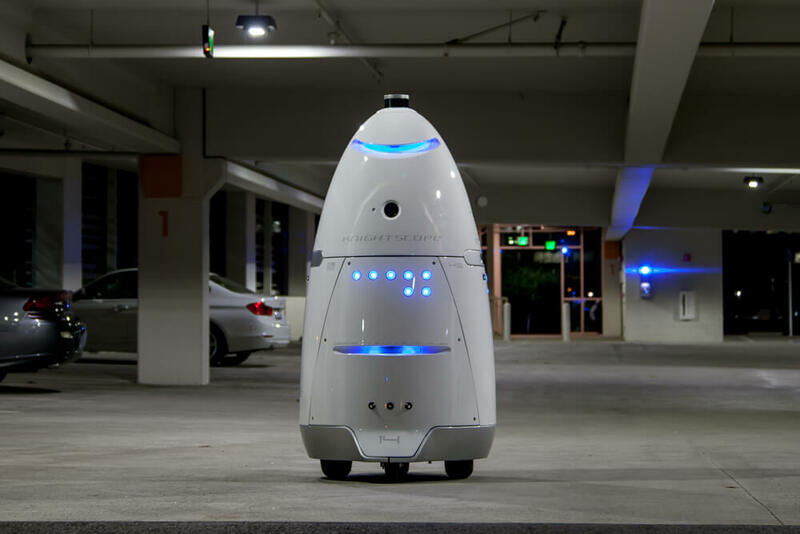 Knightscope is a new company with a unique robotic system that does not replace human officers but does greatly extend their range.” And they have some good news. Knightscope, developer of advanced physical security technologies focused on significantly enhancing US security operations, and Securitas AB (SECU-B.ST), the world’s second largest private security company, announced today that the parties are extending their channel partner agreement through February 2020. The agreement gives Securitas Security Services USA, Inc., a subsidiary of Securitas, rights to offer Knightscope’s technologies to its significant existing customer base, while Knightscope continues to develop new technologies and provide operational support. Any resemblance to the Daleks is strictly coincidental. I am sure. (14) UNDERSTANDING FUTURISM. New from McFarland, Science Fiction and Futurism: Their Terms and Ideas by Ace G. Pilkington. Science and science fiction have become inseparable—with common stories, interconnected thought experiments, and shared language. This reference book lays out that relationship and its all-but-magical terms and ideas. Those who think seriously about the future are changing the world, reshaping how we speak and how we think. This book fully covers the terms that collected, clarified and crystallized the futurists’ ideas, sometimes showing them off, sometimes slowing them down, and sometimes propelling them to fame and making them the common currency of our culture. The many entries in this encyclopedic work offer a guided tour of the vast territories occupied by science fiction and futurism. (15) RING THAT BELLE. John Ostrander talks about The Other in “The Face in the Mirror” at ComicMix. The most recent issue of Entertainment Weekly featured an article about and interview with Emma Watson, playing Belle in the upcoming live-action Disney version of Beauty and the Beast. She may be best known for playing Hermione in the Harry Potter films. In addition to being very talented, Ms. Watson is also very smart and very articulate. As the article notes, she has also been a leader in feminist causes. That sounds right to me. We’ve seen that attitude prevalent not only in movie fans but comic fans as well. There’s a wish fulfillment, a fantasy fulfillment, in comics and comics-related TV and movies, in fantasy as well and we want to be able to easily project ourselves into that. For some male fans, a woman doesn’t cut it. The bias also can extend to seeing someone of a different race as the hero. I think it’s certainly true about sexual identity as well. To appeal to a certain demographic, the hero, the lead, cannot be female, or black, or gay. And heaven forbid they should be all three; tiny minds might explode…. Are you Arab? Do you wear a turban? Are you black? Are you gay? Are you female? Then you are not like me, you are “Other.” And that is inherently dangerous. We cannot be equal. It comes down to “zero-sum thinking” which says that there is only so many rights, so much love, so much power to be had. If I have more of any of these than you, I must lose some for you to gain. Some of the people feel they don’t have much. I remember a line from Giradoux’s one-act play The Apollo of Bellac: “I need so much and I have so little and I must protect myself.” Sharing is not gaining; sharing is losing what little you may have. Except it’s not. If for you to keep your power intact, you must deny someone else the power to which they have a right, it’s not really your power. It’s theirs and it’s been stolen. Pop culture has its part to play. Putting women, blacks, gays, Latinos, and others in the central role helps normalize the notion of equality. Mary Tyler Moore did it; Bill Cosby (gawd help me) did it, Rogue One does it. However, pop culture can – and has – also re-enforced negative stereotypes. So – how do we engage it for more positive results? Denny O’Neil, many years ago, when he was editing a special project I was working on told me, “You can say anything you want but first you have to tell a story.” That’s your ticket in. “Tell me a story” appeals to the very roots of who we are as human beings. It’s how we explain and codify our world. If you want to open a closed mind, go through the heart. Don’t lecture; engage. Show, don’t tell. Showing women, blacks, LGBTQ, Latinos, Asians, and so on as heroes, as something positive, normalizes the notion. If I can be made to identify with them then The Other is no longer strange; they are me and, thus, not other. (16) BRADBURY ASSOCIATIONAL ITEM. I’d tell you to start shaking the change out of your piggy bank except that will only work if you filled it with gold sovereigns. Still available on eBay, Ray Bradbury-owned oil painting by Raymond Bayless. Price: $15,000. Ray Bradbury personally owned Raymond Bayless painting, titled, “War of the Worlds, H.G. Wells”. Art depicts the famous naval battle from the story between a martian “Tripod” weapon and English ironclad, the HMS Thunder Child. Cityscape along the horizon is on fire, and the ship also goes up in flames with a cloud of black smoke, the martian chemical weapon, rising from it. Painting features a color palette of predominantly light blues and greys, accented in orange, black and white. Signed, “Raymond Bayless 91,” at lower left. A sticker on verso is also signed by the artist. Oil on Masonite painting is framed to an overall size of 18.75″ x 24.75″. Near fine. With a COA from the Bradbury Estate. 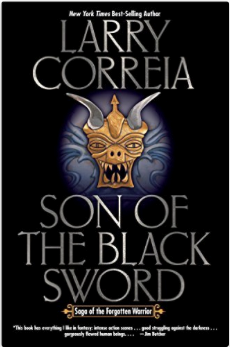 The Conservative-Libertarian Fiction Alliance’s pick for Book of the Year is Larry Correia’s Son of the Black Sword (Saga of the Forgotten Warrior Book 1). Second place went to Michael Sheldon for his debut novel The Violet Crow: A Bruno X Psychic Detective Mystery. In third place is Jack July, for Amy Lynn: Golden Angel. The winners and the nominees will receive an electronic badge with CLFA logo reflecting their respective achievements. First Place Winner also gets a framed certificate.